At one time in my life, I worked a temp job as a telemarketer. It was a great job because I didn’t have to sell anything but instead just took orders from people who were responding to a television commercial. What it meant was that I would sit in a room with lots of other “service reps” and wait for the phone to ring. You could tell when the commercial ran because there would be a wave of calls that would last for about 10-15 minutes. The rest of the time we sat and waited. For me, it was a fruitful time of reading because it helped the time pass. It was during that time that I read Fyodor Dostoevsky’s The Brothers Karamazov. I have never considered myself a big book reader because I read so slowly. Certainly there are a lot of books out there (and many fewer good ones), so you can’t, or may not have time to, read them all. But Dostoesvky’s books are well worth it. For me, the hardest part about it other than the sheer length of the books was reading the Russian names and them keeping them all straight through the book. Once I determined to note them without devoting too much time to sounding them out, it got easier. Fyodor Dostoevsky’s crowning life work, The Brothers Karamazov, stands among the greatest novels in world literature. His exploration of faith, doubt, morality, and the place of suffering in life are equaled in no other work of literature, save the Bible. The book explores the possible role of four brothers in the unresolved murder of their father, Fyodor Karamazov. At the same, it carefully explores the personalities and inclinations of the brothers themselves. Their psyches together represent the full spectrum of human nature, and continuum of faith and doubt. Ultimately this novel seeks to understand the real meaning of existence and includes much beneficial philosophical and spiritual discussion that moves the reader towards faith. This new abridgment done exclusively for Hovel Audio by Russian Studies scholar Thomas Beyer keeps the important religious themes of the novel intact. It is an excellent way for the admirer of Dostoevsky to refresh himself, or to introduce Dostoevsky to a friend who has yet to experience the joy of reading his works. Fyodor Dostoevsky (1821-1881) writes with a passion and keen insight of biblical grace like no other modern novelist. His works Crime and Punishment and The Idiot testify to his great skill. 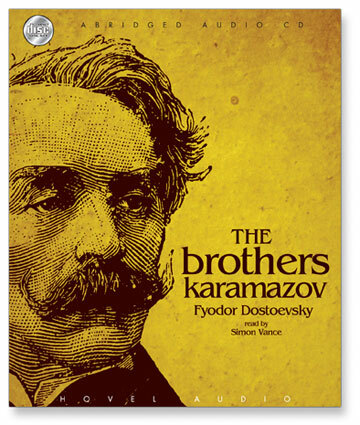 The Brothers Karamazov has been hailed by readers for over a century as one of the finest achievements in all of western literature. Thomas R. Beyer is Professor of Russian at Middlebury College in Vermont. He holds three degrees in Slavic Literature including a Ph.D. from the University of Kansas. In his decades of teaching, Tom Beyer has read The Brothers Karamazov dozens of times. His abridgment of the novel for Hovel Audio shows his thorough knowledge of his subject.